DIE Mercurii, 17 die Octobris. Message to H. C. for a Conference on the Vote against the Importation of French Commodities. Bill to prevent Importation of Irish Cattle. Style of Messages to H. C. for Conferences, to be considered. Hodie 3a vice lecta est Billa, "An Act for Supply of Part of the Jointure of the Lady Elizabeth Noel." 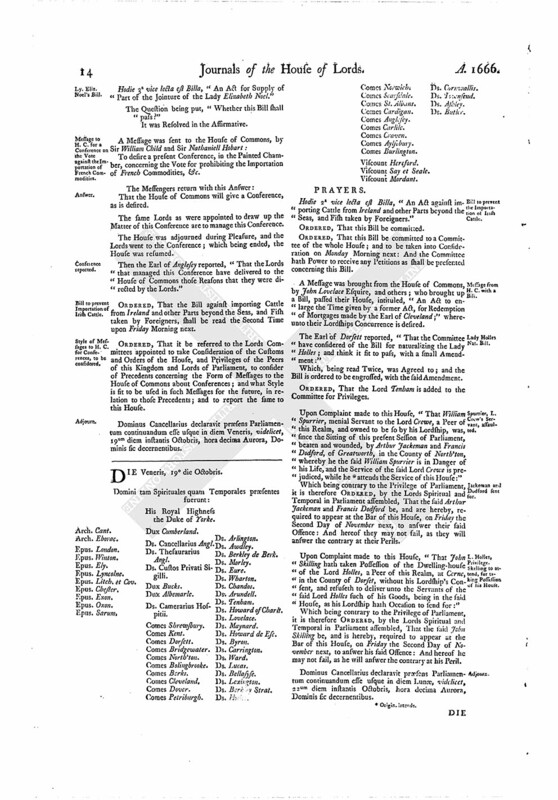 To desire a present Conference, in the Painted Chamber, concerning the Vote for prohibiting the Importation of French Commodities, &c.
That the House of Commons will give a Conference, as is desired. The same Lords as were appointed to draw up the Matter of this Conference are to manage this Conference. Then the Earl of Anglesey reported, "That the Lords that managed this Conference have delivered to the House of Commons those Reasons that they were directed by the Lords." ORDERED, That the Bill against importing Cattle from Ireland and other Parts beyond the Seas, and Fish taken by Foreigners, shall be read the Second Time upon Friday Morning next. 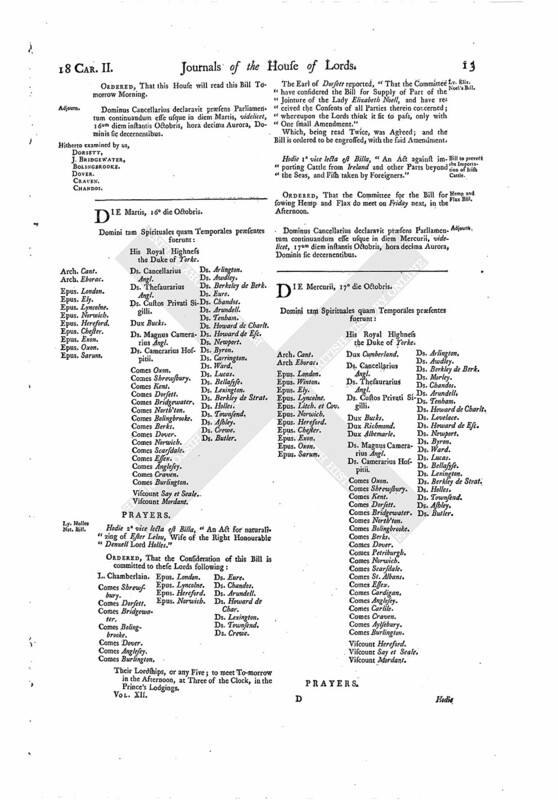 ORDERED, That it be referred to the Lords Committees appointed to take Consideration of the Customs and Orders of the House, and Privileges of the Peers of this Kingdom and Lords of Parliament, to consider of Precedents concerning the Form of Messages to the House of Commons about Conferences; and what Style is fit to be used in such Messages for the future, in relation to those Precedents; and to report the same to this House. Dominus Cancellarius declaravit præsens Parliamentum continuandum esse usque in diem Veneris, videlicet, 19um diem instantis Octobris, hora decima Aurora, Dominis sic decernentibus.